Beginning July 13 and continuing for the next three weeks, we will release one or two items on our list per day, beginning with No. 25 and working our way up to story No. 1. Today, we announce No. 23. It was a team built for this championship run. Seniors Lindsey Johnson, McCall Christensen and Alyssa Hirschi formed the core of a Brighton High girls basketball team that had everything – size, skill, scoring, defense and the addition of a sophomore superstar. 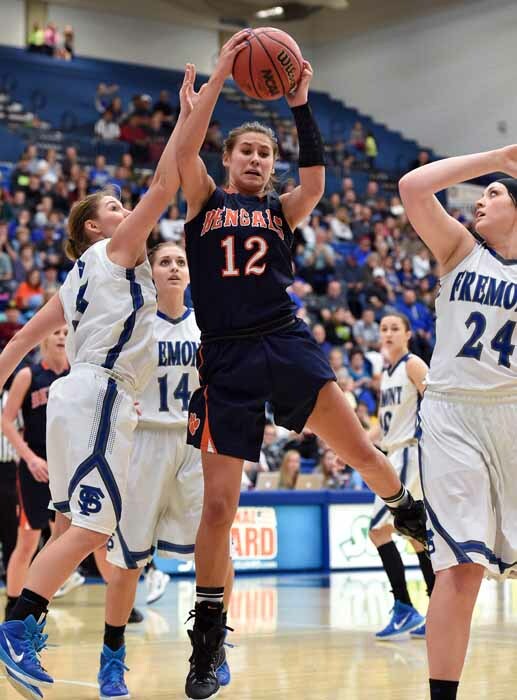 Dani Barton, a 5-foot-11 forward, is not only a talented basketball player, she is a superb athlete, and the piece that completed the puzzle for the Bengals. Those three senior leaders, plus senior guard Sammie Smith coming off the bench and junior Jade Summerhays made Brighton a very good team, but Barton made the team complete. The Bengals entered the postseason 15-4, carrying the top seed from Region 3. That put them into a first-round matchup with Region 4 No. 4 Westlake. It was a more difficult matchup that most 1 vs. 4 battles usually appear, but the game was much more competitive than most expected it would be. It was Barton who carried the Brighton offense, scoring 21 points through the first three or so quarters, but then the sophomore went to the floor after a collision that took place on a drive to the basket. She was in obvious pain while being helped from the court and as she sat at the end of the Bengal bench, with her ankle elevated and iced. The seniors gathered the team together and Brighton rallied to hold off the Thunder 49-45 to advance in a tournament the Bengals fully expected to win. With a talented Layton squad waiting for a second-round showdown, the waiting game began. As it turned out, Barton had a fracture in her ankle, but she showed up two days later, with a brace and a will to fight through injury to help those seniors get their much-anticipated shot at the title banner. Barton came out of the gates strong against the Lancers, appearing to ride the adrenaline to a huge first half. She used a mix of post moves and jump shots to amass 13 points and four rebounds before intermission as Brighton built a lead early that all but disappeared before halftime. The Bengals pulled away again in the third period, and with Barton laboring a bit, it was Johnson who stepped up to lead the way. Mostly, however, it was at the defensive end where Brighton got it done, holding Layton to just four third-quarter points, and that was enough to set the tone for another four-point victory. 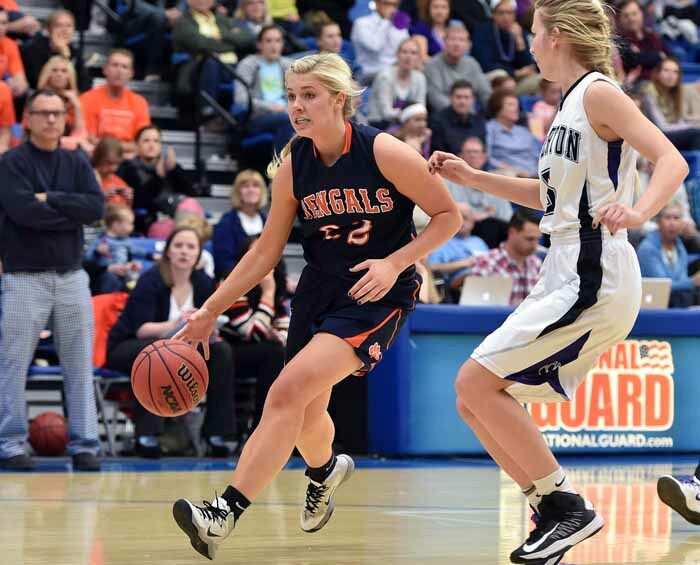 It was defensive effort once again that carried the Bengals into the title game, as they held Riverton to five points in the second and three in the third as Brighton built a 33-18 lead that turned into a 43-31 victory. For Barton, it wasn’t the normal smooth delivery, but more of a gutsy battle that ended in a double-double (10 points, 11 rebounds). 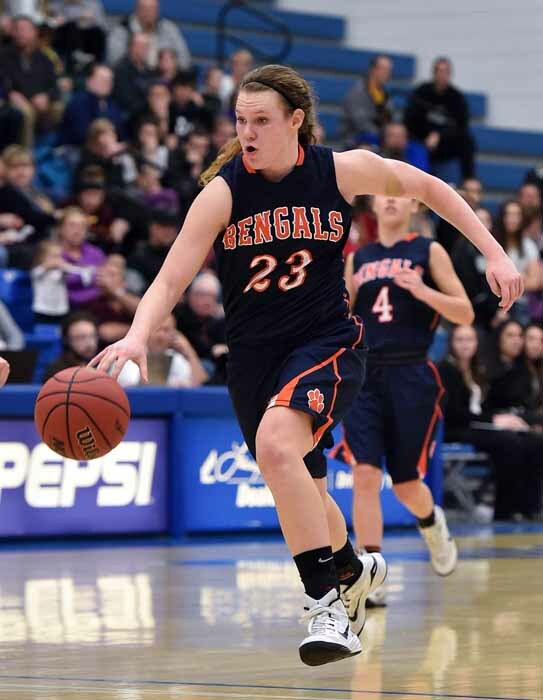 More important was the double-double turned in by McCall Christensen, as her 15 points, 11 rebounds led the way. 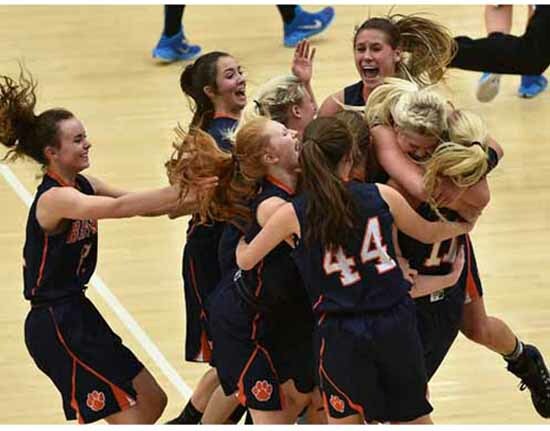 The championship game was more of the same, and after scrapping a box-and-one defense designed to slow down defending champion Fremont’s Shelbee Molen, who finished with 20 points, the Bengals found the will to take down the Silver Wolves 49-40. The championship game performance pretty much summed up the season for the new state champions. It wasn’t always pretty – Brighton lost both region battles during the regular season to Copper Hills – but it was effective. In the title game, Johnson was the leading scorer with 13 points, while Barton scored 12 and pulled down eight rebounds. Christensen totaled 12 and six, and Hirschi ripped down 10 huge boards while scoring eight points. Barton will be back as one of the top players in the state next season, but she will have to find a way to do without that quartet of seniors who showed up when it counted. Stars shine in big games, but for the Bengals, everyone saved her best for that moment under the bright lights.